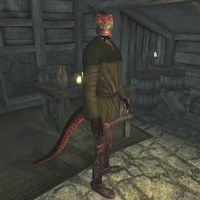 Cat-Face is an Argonian ostler who sells Paint Horses at the Five Riders Stables outside Leyawiin. With his Khajiit employee Atahba in charge of tending the horses, Cat-Face takes care of the business and never even leaves the stables. He gets out of bed every day at 6am and starts the day by relaxing for two hours before unlocking the door at 8am. For the next twelve hours, the stables will be open for customers. Cat-Face will always be available and is also willing to interrupt his two-hour lunch at noon for a transaction. At 6pm, he sits down and enjoys his dinner until 8pm. After two hours of relaxing, at 10pm, he heads to bed. Cat-Face will sell horses 24 hours a day, but the door to the stables will be locked outside the regular opening times. He wields an iron longsword and wears lower-class attire: a dark green shirt, a pair of laced leather pants and stitched leather shoes. He also carries a small amount of gold. Outside the stables, Atahba will urge you inside with the words: "I can't sell you any horseflesh. You'll have to go inside and talk to Cat Face [sic]." When you approach the oddly named Argonian, he will welcome you and make a confession: "Welcome to the Five Riders Stables! I have many fine horses for sale. Okay, so only one, but it is a fine Paint horse." If he sees you as a potential customer, he will give you the full sales speech: "The Paint horses of Leyawiin are the least expensive in all of Cyrodiil! You can't get a better bargain." Should you change your mind and decline his offer, he will say: "If you are trying to bargain with me, these horses are already the cheapest in Cyrodiil. Take it or leave it." Should you choose to accept his offer, he will point you towards Atahba with the words: "Yes. It is a fair price. Atahba will have your Paint horse saddled and ready outside." If you don't have 500 gold, he'll tell you "Suit yourself. I'm practically giving them away at that price." Cat-Face has both an unused greeting and an unused response to the Leyawiin topic, neither of which are voiced. His greeting would've been an explanation of his name, followed by his sales speech while he goes off topic quite a bit: "Cat-Face. Yes, that's right. That's what they call me. Because they can't pronounce my Black Marsh name, I guess... ... and, supposedly, because my face looks like a cat. Don't see it, myself. Must be a joke. Don't get the joke, either... but the customer is always right. But, as I was going to say, welcome to Five Riders Stable. Five? Riders? I don't see them, either... ... But that's what they call the stable when I buy it, and what do I care what they call it...? Where was I? Oh. Yes. We sell paints. Good horses. Good enough, anyway... ... good eating... they tell me... That's a joke. I wouldn't eat one of these horses. Nothing wrong with them, of course... ...but that's a pile of money for horse steaks, isn't it?" His Leyawiin topic would've informed you about various bandit hideouts: "West of the Niben, with all the troubles, many bandits. West of town I know two lairs where bandits hide... Telepe and Undertow Caverns. North along the Green Road is another hide-out... Rockmilk Cave. Like to hunt bandits? Steal from those who steal? Such a sweet joke, yes?" This page was last modified on 2 December 2018, at 17:31.